While I was away in Bangkok in early June for a work conference, my boss and colleague decided that my apartment was too expensive. I totally agreed – the real estate scene in Monrovia is absolutely ridiculous, and landlords charge exorbitant fees ($30k+ per year is the norm for a two bedroom!) for places that are not very well maintained at all. But it was a bit of a shock to come back to Monrovia only to find out that I had to find a new apartment and move in the next week…especially since Nick was out of town. Luckily a friend knew of a reasonably priced place coming available in her compound. The area is called South Beach – sounds chic, doesn’t it? 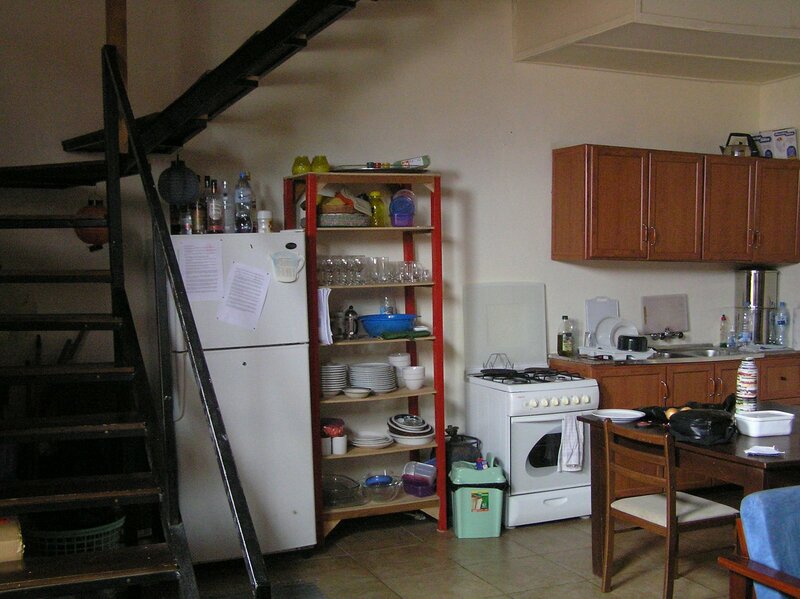 It is a small group of only 6 apartments, attached two-story places. The address (Gurley Street) is actually a pretty dodgy area – but it is built adjoining another, posh-er group of apartments called Mega Compound. At the end of our street is the beach – but there is also an informal settlement, which are basically just shacks that house most of Liberia’s population. The house is a loft-style place, and it is one of the most unique places I’ve seen in Monrovia. 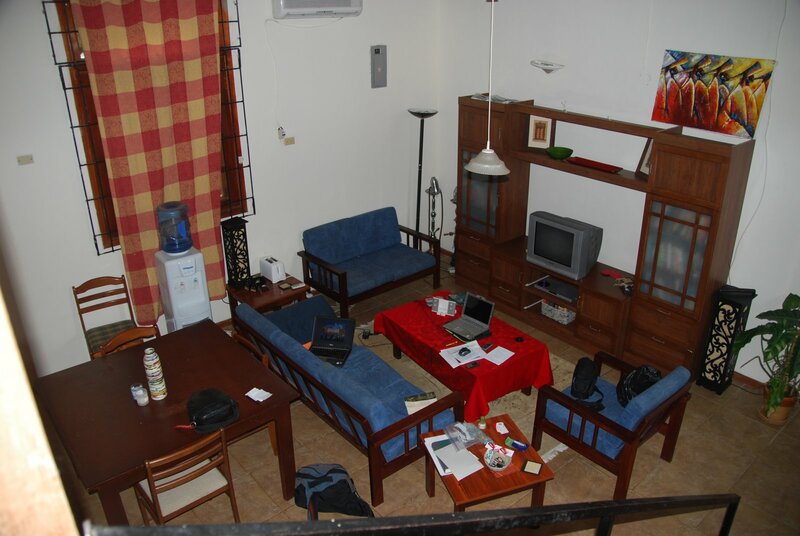 Most of the apartments we’d seen, including our own, have monstrous rooms with marble or tile floors, intense over-sized furniture, ostentatious decorations, etc. In most places you couldn’t imagine having enough furniture to ever fill the place or make it cozy. 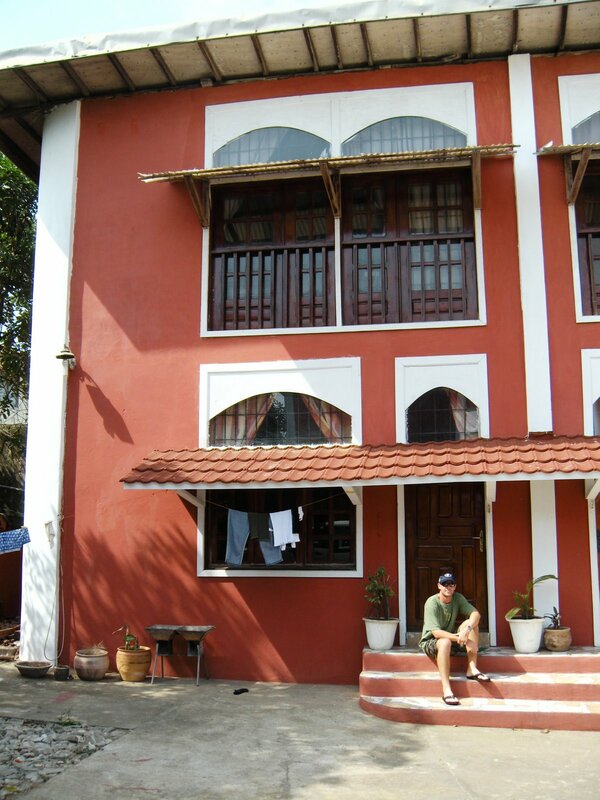 The ‘Pink Palace’, as one of our friend named our compound (it’s kind of pink-ish red…) is the opposite of all of this. The downstairs is one room, which has a tiny kitchen area and living room, high ceilings with wooden beams, and dim-sih lighting. The open stairs curve around to the upstairs, where we have a big open bedroom with built-in wooden closets, a big table we use as a desk, a huge wicker chair with overstuffed pillows and a small bathroom. One of our friends said the place reminds them of a ‘chalet’ – I’m not sure if it’s exactly that, but it is definitely cozy. Like almost all places in Liberia, our apartment is powered by generator. Unlike our last place, we no longer have power 24 hours a day. We have about 18 hours a day – from 5pm – 8:30am and from 12-2pm. It doesn’t bother me much during the week, since I am at work most of the time. But poor Nick – he is often home during the day, and has to plan ahead to make sure he has everything he needs (laptop battery charged, ipod if he wants to go for a run, email downloaded, etc) before the power goes out. On the weekend it is a challenge – we want to make toast and the power goes off, so it’s back to toasting bread over the gas stove. Or we feel like we should not ‘waste’ the power and hang out at home when it is on, heading for the grocery stores or the pool when it’s off. We try not to open the fridge much, and it gets pretty hot very quickly without the AC. Makes sleeping in kind of a pain! The parking situation is a bit dire – there is only a very small parking space, enough for each of the houses to have one car parked there IF and only if everyone parks well. Of course that never happens. I routinely get frustrated when I come home that some idiot has parked their giant SUV crooked, taking up two spots, or has parked me in in the morning. I’m getting better at backing out of tough parking spots. The best part about our place is that the compound next door has a pool that we can use. It’s just a minute away, and almost makes up for having no porch or view whatsoever (our windows look onto the parking lot). But we plan to take full advantage of the outdoor space we have! I have been swimming laps, and it’s great to be back in the water, even if I get dizzy from the million flip turns I have to do (it’s not a very big pool). It’s not heated, but it doesn’t need to be – in the dry season the sun practically boils it so it feels a bit like a bathtub. 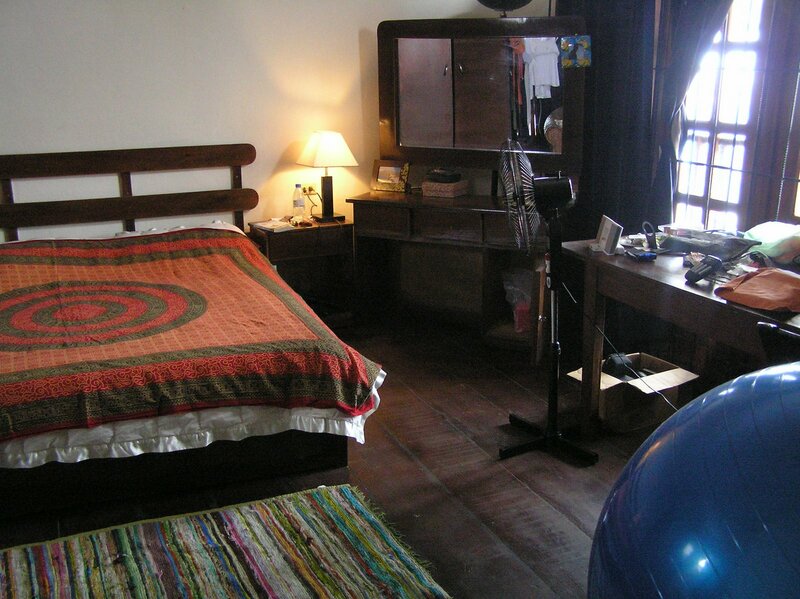 I’ve attached a few pics so you get an idea what the place looks like. 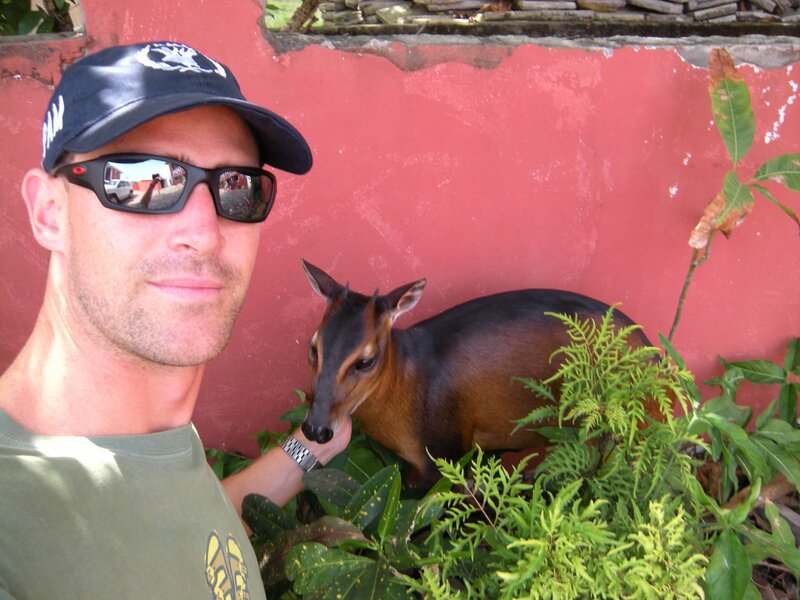 The strange looking animal is a duiker – it has a gimpy back leg and lives in the compound. It’s pretty tame, as you can see! This entry was posted in Liberia by jlgeib. Bookmark the permalink.